A long time ago I met with a student who said: "I know that God loves me. What I want to know though - is does He like me?" The answer to that question is a resounding YES! God not only loves you - but He likes you. He enjoys - He treasures you. 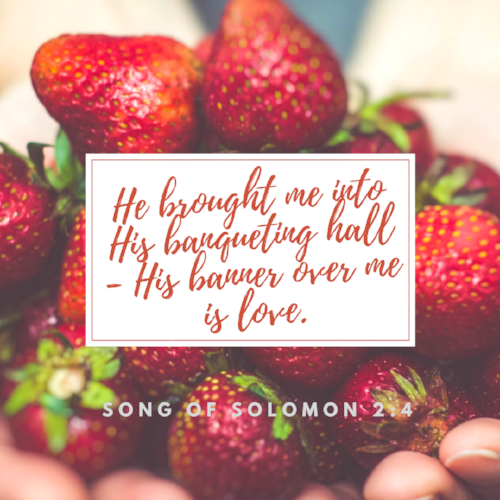 Or - as this verse puts it ... "He brings you into His banqueting hall - and spreads His banner over you - and that banner is love!" This isn't just the action of someone vaguely tolerating ... it's the the lavishly celebratory action of someone ecstatically over the moon for you! Even if I'd done everything perfectly that I meant to do - and never at all done any of the things I regret doing - there's still no way I'd deserve such lavishly royal treatment. God's not fooled though - He knows. And still. This is not a very different image from the one Jesus paints at the end of the parable of the prodigal son ... but more on that later. The point is - He doesn't love us so lavishly because I earned it - because it pleased Him so much to lavish so much love on one such as me who couldn't deserve it. You know - this was written by Solomon - who's court was so wise - so fine - that it was the court that everyone around just had to see. This was no low-brow banquet hall ... the feast God throws over you - His own cherished and treasured one - this was the event of the year ... this was Prince William's Princess Kate's wedding - broadcast all over the known world. He not likes you - but wants to be seen by everyone with you! When did you last feel so cherished and loved? If you ask God - He'd say "Yesterday"
But - take a moment to reflect - that to Him - you are so loved and cherished today. There are many ways to remind ourselves that God feels this way towards us - among my favorite are meditating on these verses ... and making others feel cherished. That doesn't have to involve banqueting halls ... sometimes just listening as generously as you can to someone will speak volumes. February 28, 2018 /JC's Village C.C.M.